I was asked a great question today: Where do I put all the things that don't have a category? Hmm... I can understand why that can be a challenge for most of us! 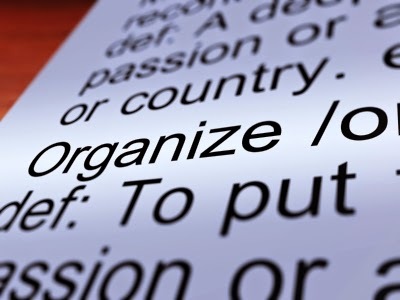 As an organizer, I tend to instruct those I'm working with to start their organizing process by sorting like items together into large categories. Today, while in an office, I was asked about all the other things that end up in that space that aren't necessarily office related. We came across batteries, gift cards, change, snacks, memorabilia and more. Mostly things that aren't going to fit in a file. First, I asked, "If you were trying to look for item 'x,' where would be the first place you'd look for it?" This tends to be a good indicator of where it makes sense to you. It's your space and belongings, so we want the organized system to work for your brain! If my client would have said, "Oh, in this drawer because (insert really clever thought process that makes tons of sense)," we would have put item 'x' there and called it a day. However, it wasn't that easy. This particular client has a great memory and responded, "I'd look for it here, where it's all piled up, because that's where I remember putting it." Well, kudos on the good memory! Remembering the homes for items is half the upkeep battle (the other half being putting the items back into those homes after using them). However, it posed a challenge for creating homes that made sense for the owner and how he used these items. We decided that part of the problem was a lack of boundaries. Change was piled up haphazardly, and batteries were rolling under foot. What we needed were boundaries these items couldn't cross - in the form of containers! Batteries were bagged and put in with office supplies. Gift cards were put in an old, empty business card holder and set inside a drawer near a bag that now held the change we found. The memorabilia and keepsakes we came across were also given boundaries. We retrieved a bin that fit well into the space to hold these memories. However, once it gets full, some decisions will need to be made as far as what gets kept and what moves on to another home in another space. These boundaries are set in order for us move more freely in our space and create a system that works with our thought processes and not against them. Sometimes the problem isn't that we don't know what we have or where it is, it's that we don't have anything to hold it all together and stop it from spilling on to the floor!